The Network Arborist: Vmotion over a VXLAN overlay. 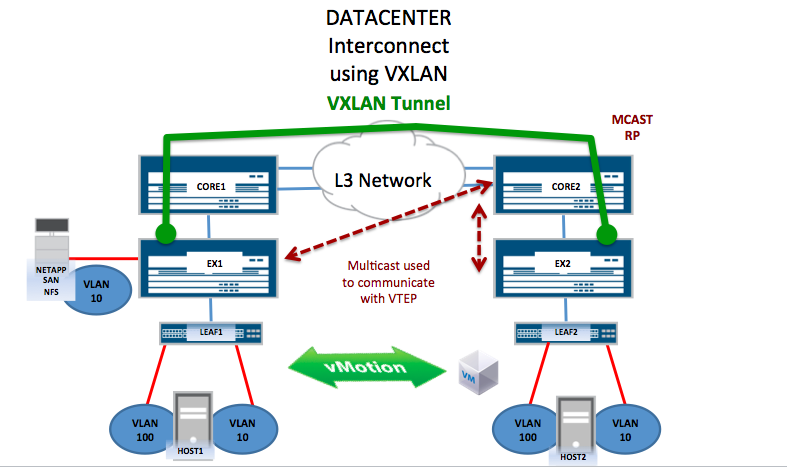 In an old Post I showed how to create a simple VXLAN tunnel to stretch Layer 2 over an Layer 3 network. Now I'll show how VMWare VMotion works over this same type of setup. Note: I researched this and it warned that VXLAN was not a solution for doing VMotion over VXLAN. The latency could be high over a DCI so VMotion may not always work. This is just a proof of concept. From what I've read, vmotion over vxlan on the hypervisor is not supported in ESXi 5.1 or earlier. I'm not sure about ESXi 5.5. In any case it doesn't matter what version of ESXi you have, because in this scenario the VXLAN tunnel starts and stops at the SPINE layer. The Hypervisor is NOT using VXLAN at all and is communicating to the underlay through a normal vlan tag. Even the leaf switch is communicating to the spine over a vlan tag. In this setup I have a NetApp SAN that will serve as the NFS datastore for the VMs. The SAN network is using VLAN 10, while the VMs Data path is using VLAN 100. On VMWare I created a NFS Datastore. The IP address of SAN NetApp is 100.10.1.254. Each Host Serveris is seperated by a L3 network as in the above topology. 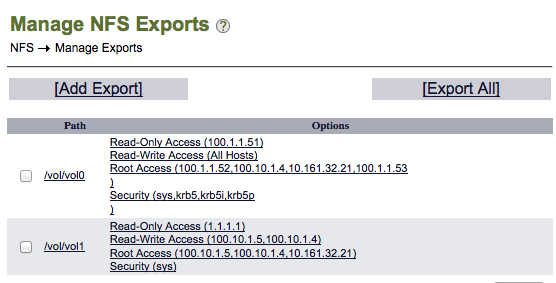 Host 1 has an VMKernal IP of 100.10.1.4 and Host 2 has an IP of 100.10.1.5 for communicating with NetApp. 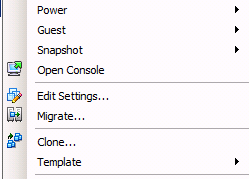 Vmotion is enabled on both dvSwitches. I created a distributed switch for the NFS network and added a 1G NIC as an uplink. This was done on both Hosts. A second dvSwitch was created for the VMs Data path. This is using a 10G NIC for the uplink. Vol1 was created which allows Read/Write access to the VMware hosts. 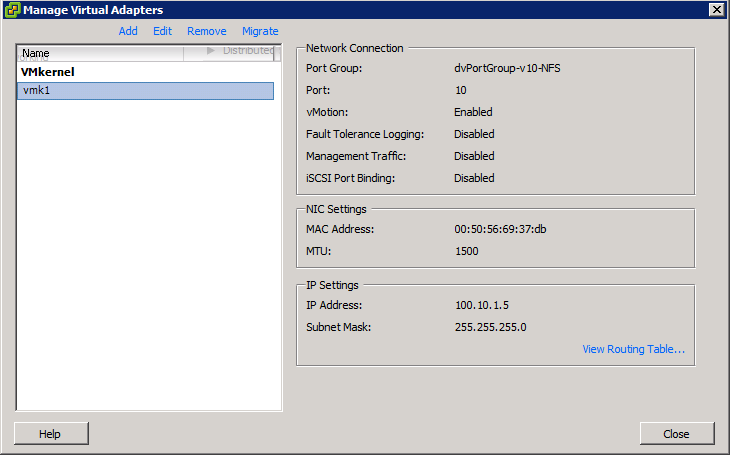 NetApps Network Interface is configured with the IP 100.10.1.254 and uses a vlan tag of 10. Interfaces are created and vlans added. The 1GE link is used for the NFS and the 10G is used for Data between the Leaf and Host1. The uplink to Spine1 is over a 10G link and has vlan member all. Again two vlans are created, but here is where the mapping of vlan to VXLAN tunnel is created. Link towards Leaf1 is a trunk with the 2 vlans. The NetApp sits only off of Spine 1 and traffic is switched there from Leaf1. IRBs are created for the two vlans. Vlan 100's IRB is the default gateway for the Data Path of the VMs. IRB for vlan 10 is used just to make sure we can ping the NetApp and the VMware VMKernal IP. PIM and IGP routing protocols are created for connectivity. ON the Remote Spine2 switch the configuration is almost the same. The only difference is that there is no direct NetApp connection, so NFS needs to be tunneled through VXLAN so the VMKernal on Host 2 can access the storage. LLDP is turned on the Juniper switches and dvSwitches so we can monitor the underlay. And a Host running lldpd. We can also see the uplink to Spine1. The things to note here are the two macs. The NetApp uses 02:a0:98:2c:06:cc which is being learned from the uplink to the Spine. And 00:50:56:6f:2c:31 is the NIC of Host 1. We can see that macs are being learned over the VTEP or VXLAN tunnel. Mac 00:50:56:69:37:db is the NIC of Host2. Spine 2 we can see NETAPP is being learned through the VXLAN tunnel. Now we are ready to do vMotion. On Spine2 it's a local mac. On VMWare I choose the Vmotion ubuntu VM. And Select Migrate and chooose Change Host and select Host1 as the Destination. Select the Priority of your choice and click Finish. On Leaf1 I can see the mac move. On Spine 1 it is local. And on Spine 2 it now sits across the VTEP. One caveat I found was that vmotion sends large frames. IP mcast + VXLAN adds overhead. So when I setup my network with the default configuration I could not initiate vmotion. I had to change the MTU size on Spine to 9000 and then it worked. So the conclusion is, you don't need VXLAN support on the Hypervisor if you want to do vMotion over a Layer 2 stretch technology. You can run VXLAN Tunnels between two Juniper Ex9200 Spine switches and map vlans to these tunnels. The Overlay is unaware of what is happening in the Underlay.